When we first envisioned traveling around on Pas de Deux, we imagined ourselves sailing from harbor to harbor, discovering charming towns and villages, and strolling through unknown streets in exotic countries. After all, this is basically what we did in our narrowboat (minus the exotic part), and we loved pulling up in a medieval harbor and spending evenings overlooking the river before drifting off to another, equally medieval harbor and doing the same thing all over again. Fuji contemplates Harwich Harbour at a still moment. Visiting the port town of Harwich, which lies at the conjunction of the Stour and Orwell rivers, has always been a sort of aspiration of ours, since it would allow us to fulfill our dreams of visiting a historic harbor without going too far afield. As a bonus, mooring in Harwich between the hours of 9 AM and 4 PM is absolutely free, giving the frugal boater more than enough time to hop off for fish and chips or a delectable portion of whelks. (I have never eaten a whelk and don’t plan to, but they are available at Harwich for purchase by interested parties.) Staying overnight costs only £15 a night for a boat under 10 meters, which is £10-20 less than the nearest marinas, and there are clean-ish showers available on the pier free of charge. There is no extra cost for catamarans, either. Up until recently, we’d been a bit timid when it came to mooring up in Harwich; locals had warned us away due to the strong current in the harbor, and online pilot guides are pretty emphatic about the lively effects of the swell and wash from passing ferries on the boats moored up there. Harwich is not known as a place to get a good night’s sleep, which may account for some of its affordability. Lately, we’ve been feeling a lot more confident about our boating skills, however, and as for the rocky waters in the harbor, catamarans are known for their stability. Surely we wouldn’t be nearly as affected by the swell as a monohull. Right? As it turns out, the current in the harbor is only bad for a few hours after high tide, when you have to be a little careful maneuvering on the inside of the pontoon. Not much to be afraid of there as long as you are cautious. As for the boats rocking and rolling in the ferry wash, on the other hand — they weren’t exaggerating. Oh, and the part about our catamaran being so stable that we would hardly feel the motion? Well, not quite. Harwich local enjoying the Ha’penny Pier. We first tried to enter the harbor a little after 4 pm, when most of the boats which were staying only for the day would be clearing out. 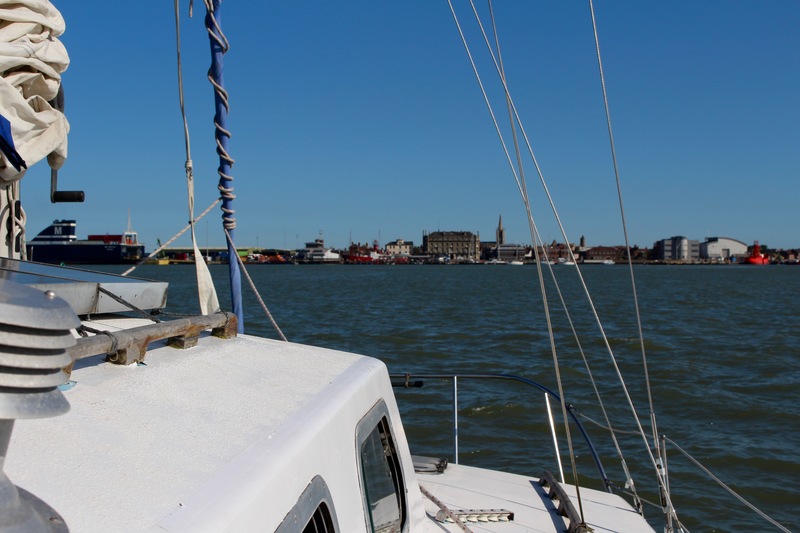 Since it is a popular destination for lots of Dutch and Belgian sailors looking for an easy hop across the Channel, Harwich is known for being a crowded harbor, and, despite the fact that it was Monday, from a distance it already seemed full. We later realized that there would have been plenty of space for us, and a better way of determining whether or not there was room would have been to get out the binoculars and count the number of masts there. Boats there will raft up in groups of three, so you can tell if there’s space if you only see one or two masts in a row. Do remember to take into account the fact that a dastardly motorboat might have snuck in between the real boats. We made a tactical retreat to the nearby Bathside Bay, just east of Ha’penny Pier, threading through the yachts moored there during a mighty strong ebb to anchor in the shallower waters beyond the shipping channel. This is one of the advantages of having a cat, although it is best to avoid drying out in an unfamiliar spot, even if there are no obstructions marked on the chart. We learned this one time when we anchored by a sandy beach just upriver from Levington, only to find that once we dried out, Pas de Deux was surrounded by giant metal spikes which could have easily pierced the bridgedeck had we settled on one of them. As for Bathside Bay, there are a few wrecks marked on the charts, as well as some other suspicious detritus, so we’d recommend sticking as close to the moored yachts as possible. I have to say that the evening that we spent there was not particularly pleasant. It is not only Harwich Harbor which is susceptible to ferry wash, and poor little PDD rocked and rolled and swung on her anchor all night long. A husky next to a Huskee sign! Something for everyone in Harwich! The next morning, we waited until a few of the overnighters had left and motored into Harwich. Finding a spot was tricky and the end of the pontoon near the ramp is reserved for fishing boats. We’d read that the inside of the pontoon is the only place where you might find protection from the swell, but all of the spots on the pontoon were taken and, as one of our crew members is an adorable dog, rafting up is difficult for us. We were therefore forced to try our luck on the outside and hope for the best. I’m sure that there are some readers who will find it amusing that one of us (OK, it was me) got seasick in the harbor, but I will hasten to remind them that even Lord Nelson and Horatio Hornblower of all people, got seasick, and no one would say that they probably should never have set foot on a sailboat. Harwich is an awfully historic place, and it seems like quite a bit has been invested in making visitors aware of this aspect; everywhere you turn, there is a sign or placard mentioning something or other that happened there: floods and fires and a tenure as MP by none other than Samuel Pepys. The most famous event – and that which should be of greatest interest to this American — was of course the departure of the Mayflower. Unfortunately, since I am appalled by the glorification of this perverse sect of human-burning religious extremists, I am not that impressed. I can just imagine the citizens of Harwich wiping their hands and saying “good riddance” once the crazed, bloodthirsty, Christmas-hating radicals shipped off, and I envy them the sentiment. As for the current citizens of Harwich, it appears that their primary occupation lies in visiting the pub, since this is about all there is to do there. Granted, we were in the historic center, and the newer section of town may provide a wider range of amusements, but it seems that pretty much all there is to do of an evening in Harwich is get a pint, reminisce about fishing trips past, and curse loudly and inappropriately. This does not detract from the charm of the place. May we suggest a pint of Broadside from The Alma? There is also a wonderful-looking historic cinema from 1911, The Electric Palace, which was one of the first of its kind and still running. Otherwise, there are some beautiful old crooked buildings in Harwich, with secret courtyards and smugglers’ alleyways tucked behind them, and it is pleasant enough entertainment just to stroll around, discreetly peeking in windows and petting the local cats. Daytime amusements include: an art center with a wide range of workshops, some interesting lighthouses, a maritime museum, a beach promenade, and two antique stores with enough old brass to outfit a 19th century steamer. Never ever ever drink the coffee at the café on Ha’penny Pier. Just avoid the place altogether. For this and all of our trips around the Stour and Orwell Rivers, we were guided by the Imray Chart Y16 and Imray’s East Coast Pilot. If you would like to buy them on Amazon, follow these links to the chart (in the US and in the UK) and the pilot guide (in the US and in the UK). These are affiliate links, so if you purchase these items or anything else within the next 24 hours after clicking on the link, we will get a little kickback for referring you. We are desperately poor and would be infinitely grateful for the help. On the other hand, if you can support your local chandler’s by shopping there first, you will be able to go to bed at night knowing you have done your duty to your community. So, it’s up to you. A small plein air study I did of the Low Lighthouse at Harwich. If you would like to take it off of my hands and help us pay for next month’s grocery bills, please visit our very new Etsy store by clicking on this link. Next The Saga of Pas de Deux, Chapter 21: Land Ho!